www.okeechobeejust4bass.com (910) 330 9821 Weekly Bass Fishing Report For The Week of Nov 19 – Nov 28, 2016. This week on Lake Okeechobee the fishing has been pretty good being it was the back side of the full moon. The water temp are in the low 70’s and the winds have been lite from the North/ North East the water clarity is good throughout the lake, now that the water level is below 15 ft. The fishing should get even better. These fish are moving around a lot now and the best bait right now is still shiners but on the artificial side the best bait is a Senko. Fishing it real slow on the grass line I have been fishing a Black/blue with a blue tail. 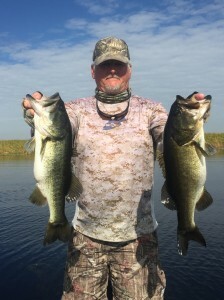 Here is a picture of a couple of fish that I caught this week you can also check the water levels on Lake Okeechobee at www.okeechobeejust4bass.com.